Top Of Europe pictures. 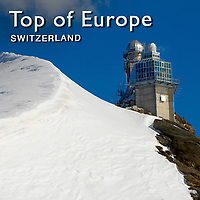 Photos & images of the Top Of Europe Swiss Alps. Top Of Europe travel pictures & images to buy as stock or prints. Strictly, the Jungfraujoch is the lowest point on the mountain ridge between Mönch and Jungfrau, at 3,471 meters (11,388 ft). It is just above this location that the mountain station of Jungfraubahn is located, Jungfraujoch railway station, which at an elevation of 3,454 meters (11,332 ft) is the highest railway station in Europe. The Jungfraujoch is often called the "Top of Europe" in tourist literature. The Sphinx (3,571 meters (11,716 ft)) is a peak that lies just to the east of the col. It begins from the Jungfraujoch on the Valais side and at the Great Aletsch Glacier. There is an elevator to its summit, where a small viewing platform and a scientific observatory, the Sphinx Observatory, are located. Europe's highest radio relay station, the Richtfunkstation Jungfraujoch, is installed atop the ridge to the west of the railway station.